Chuck your pre-conceived notions in the bin, dear reader. 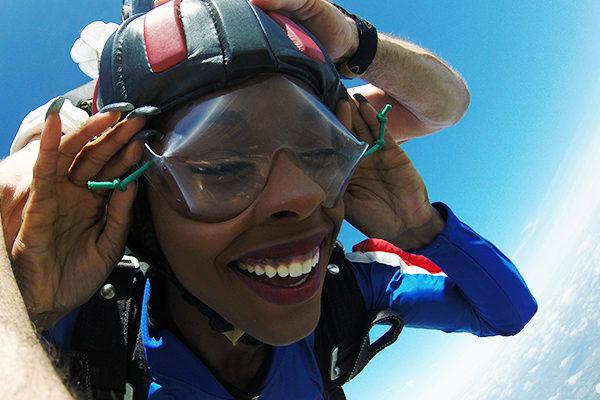 First-time skydiving doesn’t hold up to any of them. 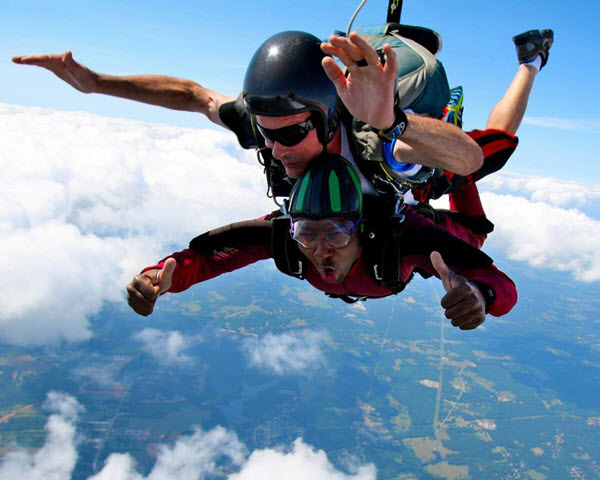 Skydiving is incredibly hard to describe, but first-timers often report that first-time skydiving feels nothing like a rollercoaster; nothing like bungee jumping; nothing like falling. They talk about how skydiving feels like a freedom the likes of which they’ve never experienced. And we have to agree! Nope! You won’t feel like you’re falling. Not even for a moment! If there’s any way to describe it, it’s that you’ll feel like you’re hovering over an enormous fan. Skydiving basically supports your body on a mattress of air molecules, never letting you get the sense that you’re plummeting out of control. Roller coasters tend to deliver their adrenaline via the “stomach-drop” sensation. You know what we’re talking about, right? The little moment of weightlessness when the car rolls over the edge? The pause, then the rip of acceleration? That, luckily, is not a thing at all in skydiving. The reason why a skydive doesn’t smack you with that sensation is that you start the jump from an airplane that’s already moving at freeway speeds. The taper-up to an average freefall speed of 120mph is just that — a taper-up, not a hard snap. Your stomach can keep up! Yep! It sure does. Most students report that skydiving is scary and satisfying in equal measure, with huge intensity. When the airplane cruises down the runway, you’ll be staring your decision to jump right in the face. That’s a scary moment, for sure! It’s also exhilarating: You’ve made the decision to be brave, and goshdurnit, you are doing it. Then, after a few minutes, someone will yell “door.” And it’ll open. Most students report that this is the scariest part. Suddenly, the temperature will drop, and it’ll get windy in there. As you move towards the door, you’ll see the students and instructors before you vanish, one by one. Once you get to the door yourself, you’ll peek down past your feet and see the ground so many thousands of feet below you, looking like a beautiful map. From there, it’s freefall. At 120MPH, the sensations will be so intense, so new and so incredible that you’ll have your work cut out for you processing even a little bit of it. To say it’s exhilarating is the understatement of a lifetime; it’s like being reborn, actually. Memories of a first-time tandem skydive look more like modern art than photographs….so, for heaven’s sake, get the video. Luckily, the more you jump, the better the resolution gets. With each jump, your brain gets better at processing the details…but it never gets less exciting! 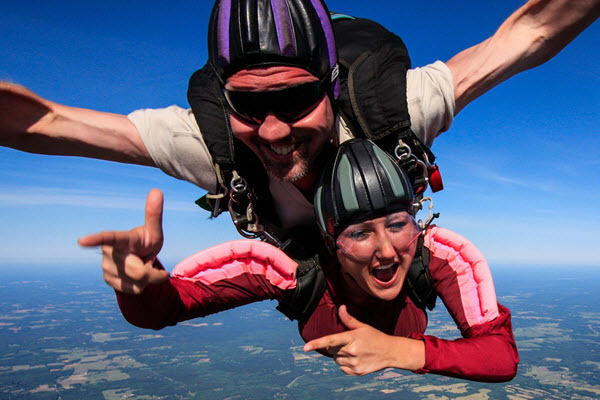 Ask any of our sport skydivers here at Skydive Monroe, and they’ll tell you: they keep jumping because skydiving never loses its mystique or its power. And it won’t for you, either!